Many restoration efforts have been made at Leo T. Cronin to increase breeding for the endangered Coho salmon (Oncorhynchus kisutch) and steelhead trout (Oncorhynchus mykiss). Watching wild salmon swimming upstream isn't just for for people with a television. This is the time of year for people in the San Francisco Bay Area to leave their couches and watch the endangered coho salmon (Oncorhynchus kisutch) spawn in Marin! 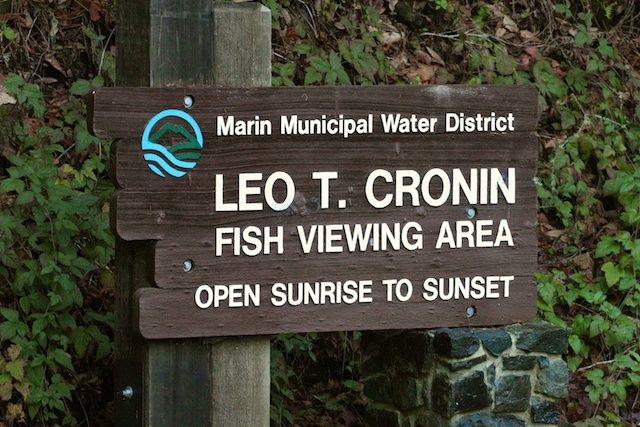 There are three main viewing sites in Marin, although the Leo T. Cronin site has the most signage and walkable path. Organizations such as SPAWN and Wild Equity Institute hold salmon tours each season for the public to observe and learn about these salmonids. From December to February, Leo T. Cronin is one of the best places to view salmon spawning. 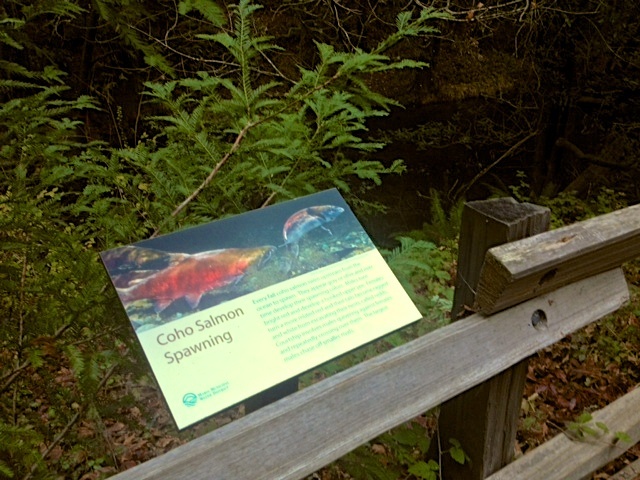 The trail alongside the creek is longer than other local salmon viewing sites, and there is more signage to learn about the species. 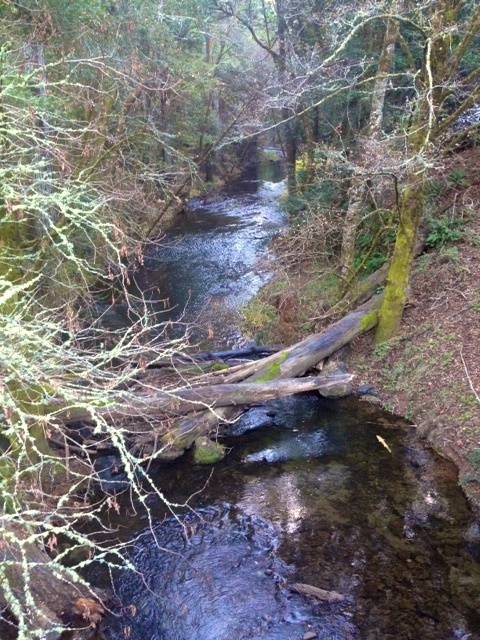 Spawning season for the coho salmon lasts until February. They are an anadromous fish, meaning, they migrate from the sea to fresh water for breeding. Male coho are more than 2 feet long, and are vibrantly green and red during breeding season. During this time, males also develop a hooked snout and large teeth. Females use their tails to dig a nest known as a "redd," and deposit roughly 100 eggs per redd. Males then release sperm, known as "milt," over the eggs to fertilize them. Incubation in California lasts until April. 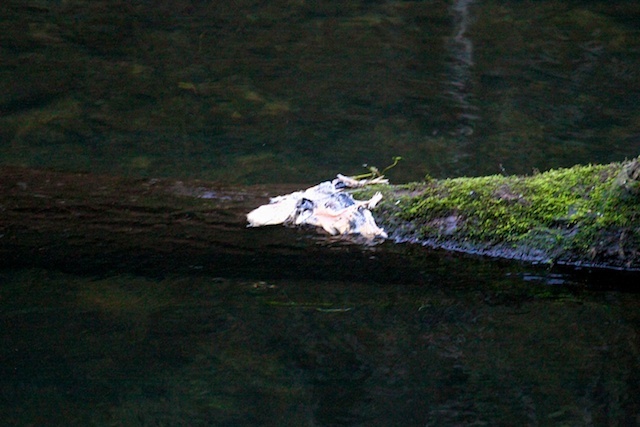 Likely remnants of a salmon that had arrived at the Leo T. Cronin viewing area to spawn and was eaten one of many predators in the area. Sadly, there are fewer and fewer salmon returning to spawn at these sites each year. Coho salmon along with the endangered steelhead trout (Oncorhynchus mykiss) have been the center of a political firestorm for conservationists and housing developers. Urban development alongside these creeks has increased non-native plant and animal species, pollution and sediment build-up, degrading the endangered coho salmon and steelhead trout's habitat. Today, less than 10% of its population remains since 1940. With the help of SPAWN, its volunteers and numerous donors, these viewing sites continue to be restored by recreating riparian habitat, removing non-native plants and replacing them with native plants. Signage at the Leo T. Cronin salmon viewing area, describing the natural history of the species. What better way to start off the new year by viewing an endangered species in your own backyard!